Apple has been awarded a patent on fingerprint technology that could potentially make it into iPhone 8 attempting to do away with a dedicated Home / Touch ID button. The United States Patent and Trademark Office has published patent number 9,460,332, relating to a “Capacitive fingerprint sensor including electrostatic lens”, which, if rumors are to be believed, could be Apple’s preferred solution to overcoming biometric detection issues in next year’s iPhone 8 considering how the device is expected to be physically designed. Dubbed as tenth anniversary iPhone, next year’s model is expected to come equipped with a big redesign. The iPhone 7 and iPhone 7 Plus, released just last month, may have a number of feature improvements and component upgrades, but it’s 2017 when Apple is expected to roll out an entirely new design that the company hopes will dramatically increase sales of the device. Part of that design is said to involve the removal of the iconic Home / Touch ID button altogether in favor of a full-screen system which means the entire front of the device will be usable display real estate. This of course introduces new hurdles for the Touch ID sensor. It would appear that this is where this awarded patent would come into its own. This technology would essentially allow Apple to embed a fingerprint sensor beneath the surface of the display, allowing it to overcome the problems introduced with the new design by using the capacitive sensing technology to detect a fingerprint even though there is a gap between the sensor and the print itself. That would mean a future Touch ID sensor, potentially bundled with next year’s iPhone 8, could sit directly below the surface of the display, but still continue to function as users currently expect. 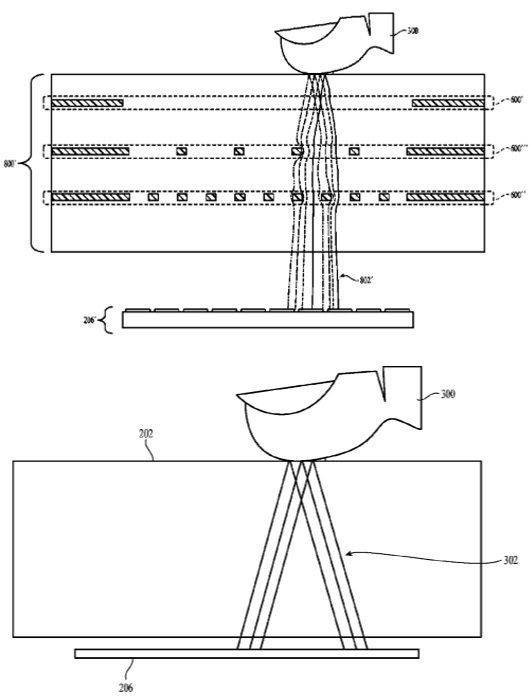 Apple’s plans for this technology are currently unknown, but it is interesting to note that the information within the patent covers a number of potential scenarios in which a solution such as this could be used in conjunction with display technology such as the rumored move across to an iPhone design that uses a full edge-to-edge OLED display. As we’ve seen previously, the awarding of a patent doesn’t necessarily mean that it will make it into a future product, but it is highly likely that this is an individual element in what is likely to be a large overhaul of the iPhone from next year and beyond. That render above is actually quite interesting. I was always so stuck up on the fingerprint / home button being directly behind the screen and the entire UI elements that I haven’t even considered having the home button still there, and then utilizing the two sides for toggles or other interesting things (in the render, its used for toggles). I think that could possibly work. Especially if they use an OLED display, since then there could also be an option do disable that feature and leave the bottom “bezel” in place. I’m more interested in seeing how Apple would handle the home buttons functionality if the entire front display is mostly screen, with a “home” button behind it. How would you differentiate between a UI press (like a nav button or link in safari etc) vs. a home button press? Would they even consider this? or would they just slim down the bezels, leave a tiny bit of a chin, have the Touch ID behind the screen near the bottom, and then the entire thin bottom would act as a pneumatic home button?